Spanning eight states Interstate 40 is a major cross-country freeway connecting the Desert Southwest with the Southeastern United States. Starting in Barstow, California, the freeway generally follows the alignment of Historic U.S. 66 across the Mojave Desert into the high desert. Spanning the Colorado River west of Kingman, I-40 gains elevation on a course south of the Grand Canyon to the city of Flagstaff. 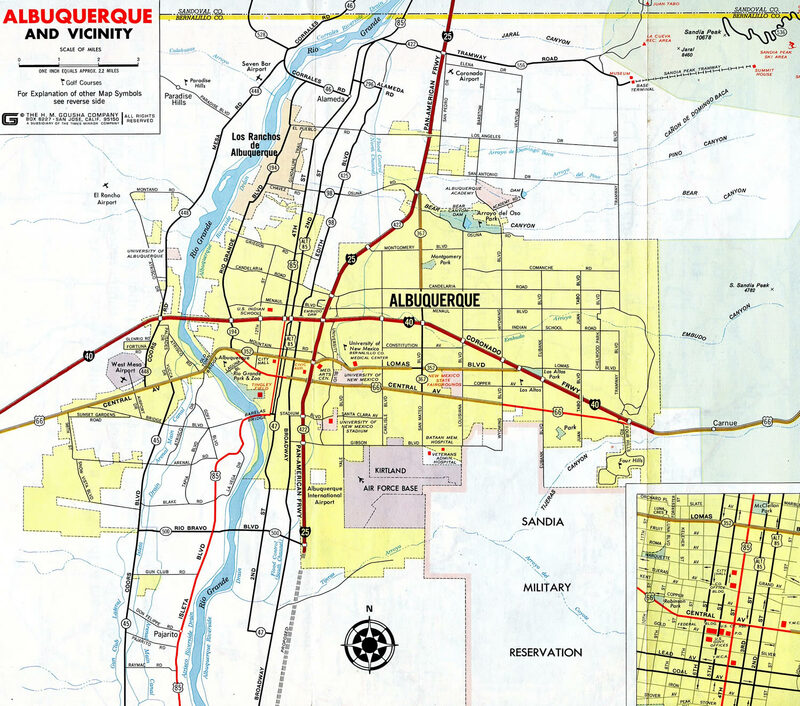 Advancing east across New Mexico, the freeway spans the width of the state, converging with Interstate 25 in Albuquerque. Continuing east, Interstate 40 enters the Great Plains in eastern New Mexico, leading into Texas. The freeway splits from Historic U.S. 66 at Oklahoma City, remaining generally eastward while U.S. 66 diverges northeast toward Tulsa, St. Louis and Chicago. Entering Arkansas, Interstate 40 trends southeast from Fort Smith along the Oklahoma state line to Little Rock. 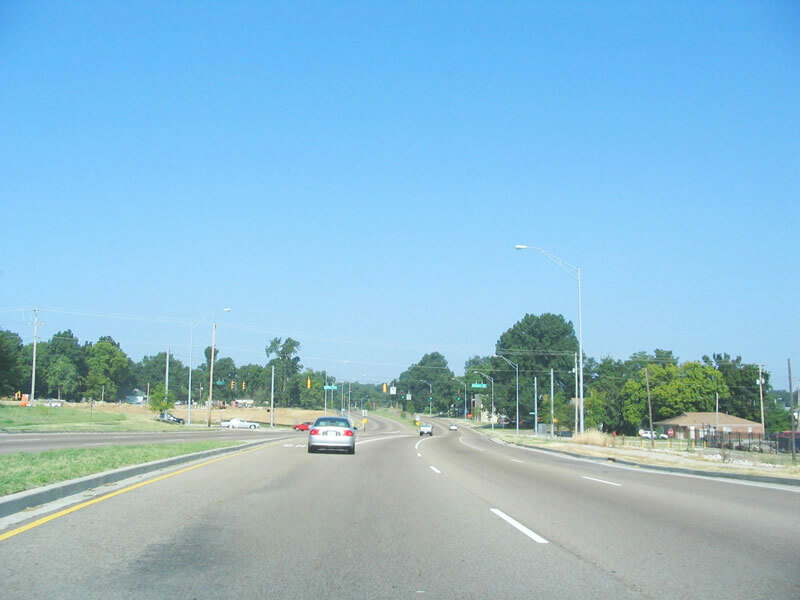 The freeway follows U.S. 70 east from the capital city to West Memphis. A short concurrency with I-55 precedes the 1973 constructed Hernando DeSoto Bridge taking I-40 across the Mississippi River. Through Memphis, I-40 follows the northern arc of the inner beltway; the southern half is I-240. The original planned alignment took I-40 across the city, using Sam Cooper Boulevard, a partially completed freeway/boulevard spur from the east toward Overton Park. Leaving Memphis, I-40 heads to Jackson and then Nashville, where it briefly overlaps with both I-65 and I-24. 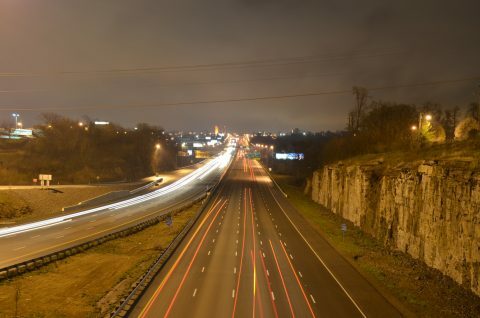 I-40 joins Nashville with Knoxville, merging with Interstate 75 along an eight-lane or more freeway leading into the metropolitan area from Farragut. 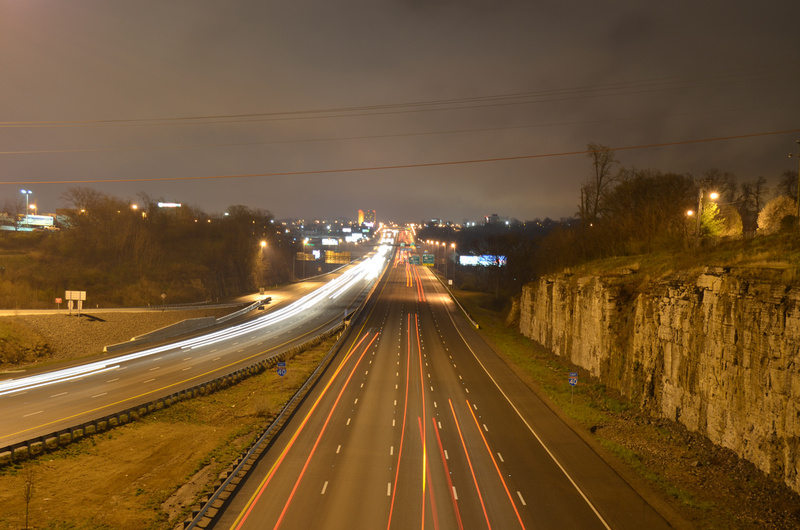 Interstate 40 carries ten lanes of traffic between Interstate 24 and Tennesee 155 (Briley Parkway) in east Nashville. Photo taken April 4, 2013. Leaving eastern Tennessee, Interstate 40 traverses the Great Smoky Mountains along a southeasterly course leading into North Carolina. Spanning nearly the width of the Tar Heel State, I-40 connects regional cities in western parts of the state including Asheville, Hickory and Statesville with the Triad area (Winston-Salem and Greensboro). Combining with I-85, I-40 continues east to Durham, where it turns southward for the remainder of its 420 mile route in North Carolina to Raleigh and Wilmington. Interstate 40 through California and Arizona is part of High Priority Corridor 16 and 70: Economic Lifeline Corridor. 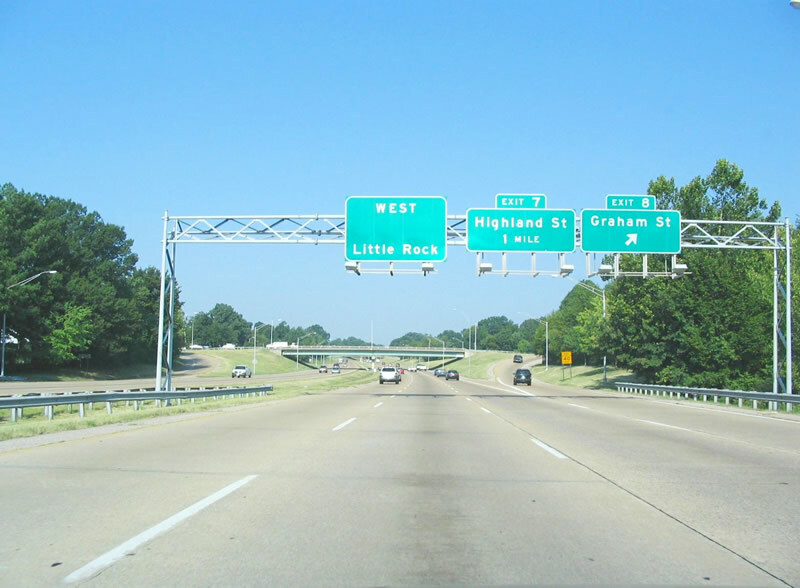 Interstate 40 between Little Rock and Memphis is part of High Priority Corridor 55: Dallas to Memphis via Little Rock. A $270 million investment in the form of interchange reconstruction culminated in 2002 with the completion of the “Big I” construction project. 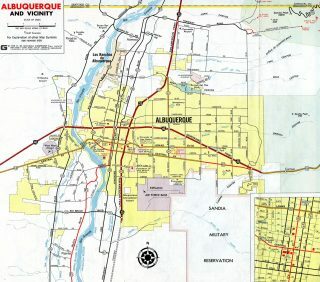 This 24-month road work commenced July 2000 with the rebuilding of Interstate 40 ramps and overpasses in and around the junction with Interstate 25. This involved the replacement of left entrance and off-ramps with new high-speed flyovers. In addition nearby frontage roads expand to two lanes and continue through the Big I area to improve traffic flow. 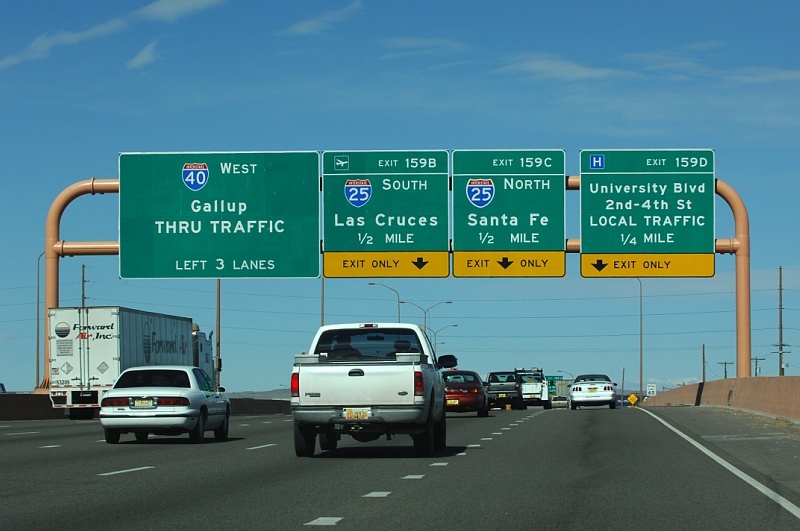 Interstate 40 east at I-25 near Downtown Albuquerque, New Mexico. The “Big I” interchange project underway in 2000-02 greatly improved this exchange. Photo taken by Jeff Royston (03/31/05). “Alternate D” represented a new alignment five blocks south of the former Crosstown Expressway, encompassing an existing railroad corridor. The project entailed the building of a surface or semi-depressed freeway with multiple access choices into Downtown including a full interchange at Shields Boulevard (original U.S. 77). With this plan, the original Interstate 40 alignment was converted to a six-lane boulevard. Named Crosstown Boulevard, the new roadway provides direct access to the Bricktown section of the city, and in conjunction with the new I-40, provides generous traffic capacity. 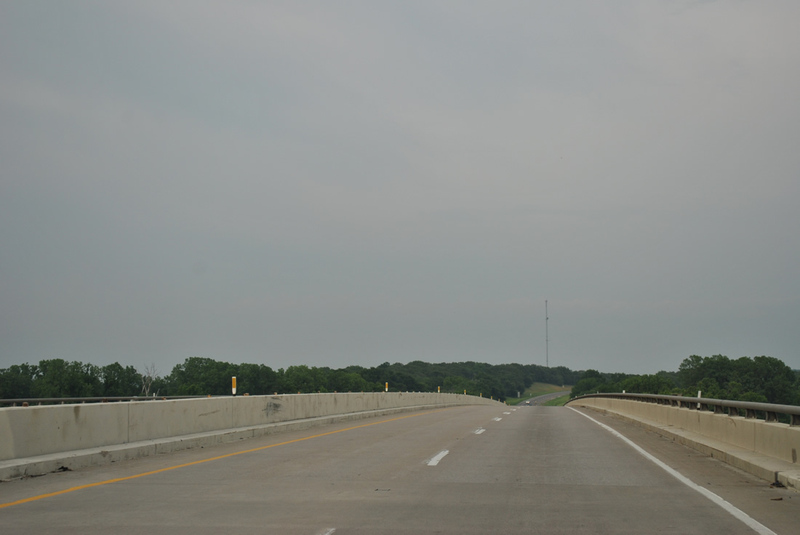 The total length of the project constituted 3.96 miles between May Avenue and Interstate 235. Several amenities were included for area residents to reduce the impact of the freeway to surrounding environs. Included was a sound wall on the south side between Walker and Robinson Streets. The wall sees an architectural design reflecting that of Little Flower Church. It runs close to I-40, allowing for a larger area of adjacent green space. Within the same vicinity a 20 foot wide pedestrian bridge spans Interstate 40 near Union Station. 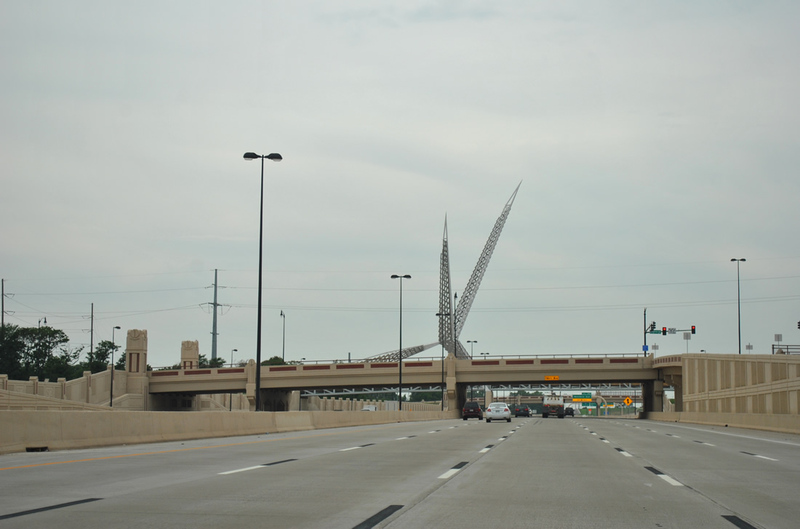 Known as the SkyDance Bridge, the 380-feet long bridge features an architectural “wing” (based off the state bird: the scissor-tailed flycatcher) rising 192 feet above Interstate 40. The Riverside neighborhood also benefits from a new park (MAPS 3) created with additional right-of-way acquisitions3 that begin construction in 2013. Final FHWA approval was granted in May 2002. This allowed ODOT the ability to design, commence right-of-way acquisition, and ultimately construct the new four-mile ten-lane facility. Ground breaking occurred in 2005, with Interstate 40 eastbound shifting to the new lanes on January 5, 2012 and westbound on February 19, 2012. The project totaled $670 million, up significantly from the $274 million4 estimates in 2003. Spanning the McClellan-Kerr Arkansas River Navigation System across the Webbers Falls bridge of Interstate 40 eastbound. Photo taken 05/06/12. Construction had yet to break ground on the Crosstown Expressway leading west from Interstate 35 in Oklahoma City in 1962. Only a short portion of I-40 was open at this time, from the brief overlap with I-35 to then-Oklahoma 3 (SE 29th Street) at Tinker A.F.B. Approaching the SkyDance pedestrian bridge along I-40 westbound. 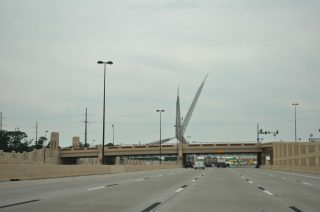 The realignment of I-40 south of Downtown Oklahoma City, OK opened to traffic in 2012. Photo taken 05/06/12. A $670-million project started with design work in 2002 and ground breaking in 2005. The roadwork shifts Interstate 40 onto a new alignment five blocks to the south from the 1965-built Crosstown viaduct. Work continued on to 2014. Westbound Interstate 40 through the 2009-completed SmartFix40 rebuilt roadway and interchange with Tennessee 158 (James River Parkway). Photo taken 06/25/12. In Tennessee, roadwork dramatically expanded the stretch of Interstate 40 from the start of the Interstate 75 overlap to the southern terminus of Interstate 81. A routine sight throughout the mid and late 1990s, construction widened the Interstate 40-75 overlap to eight lanes, and Interstate 40 east of Knoxville to six lanes. The Tennessee Department of Transportation followed those projects with the Smartfix40 reconstruction to rebuild and expand 2.5 miles of Interstate 40 between Interstate 275 and the Cherry Street interchange (Exit 390). This project included an extension of Hall of Fame Drive (5th Avenue Connector) southeast to Summit Hill Drive from its current terminus at Broadway (U.S. 441) and an interchange modification for the Broadway and Tennessee 158/James White Parkway junction (Exit 389). Work also involved alteration to the Cherry Street interchange, a realignment of U.S. 11-70/Magnolia Avenue to East 5th Avenue, and the relocation of Fourth Avenue to the west of Interstate 40.2 Work shut down the Tennessee 185 (James White Parkway) freeway in 2007 to rebuild that roadway and parallel Hall of Fame Drive. The SmartFix40 project followed in 2008 with a complete closure of Interstate 40 between Interstate 275 and Cherry Street to tear down and rebuild its viaduct, which was completed in 2009. Major road work commenced in August 2012 on a modernization project for Interstate 40 between U.S. 21 and Interstate 77 at Statesville. The $89-million project, expected to last until March 2017, reconstructs the cloverleaf interchange between the two freeways into a high-speed directional interchange. Adjacent work with U.S. 21 upgrades the diamond interchange into a diverging diamond interchange (DDI). One of the first Interstate 40 relocation projects was the construction of a southern bypass for Interstate 40 around Winston-Salem. Built and opened to traffic in 1993, Corporation Parkway provides a southerly bypass of Downtown Winston-Salem for I-40 travelers. The former freeway alignment is now part of Business Loop I-40. The Winston-Salem Northern Beltway is under construction as of 2015; this belt route would be designated as Interstate 74 and Interstate 274 once it opens to traffic. The Greensboro Urban Loop, which eventually will form a 360-degree loop, was slated to carry Interstate 40 around the city of Greensboro. The portion of the loop south of the city was constructed through the early to mid-2000s. The southeastern section opened on February 21, 2004 as a new alignment for Interstate 85, and the southwestern portion opened on February 21, 2008. With the completion of the southern half of the loop, I-40 was relocated onto the bypass for just seven months, and the old freeway alignment was redesignated as Business Loop I-40. September 2008 saw I-40 rerouted back through Greensboro and U.S. 421 relocated from through the city to the southwestern bypass. The Greensboro Urban Loop is also designated as part of Interstate 73, and the future northern half of the loop is designated Interstate 840. In North Carolina, widening between the Durham Freeway (Exit 279) and Interstate 540 (Exit 283) brought Interstate 40 up to seven lanes. This stretch received 147,000 vehicles per day, so the widening was generally a welcomed sight. Expansion to eight lanes, which entailed adding a fourth westbound lane, was completed on October 1, 2003. 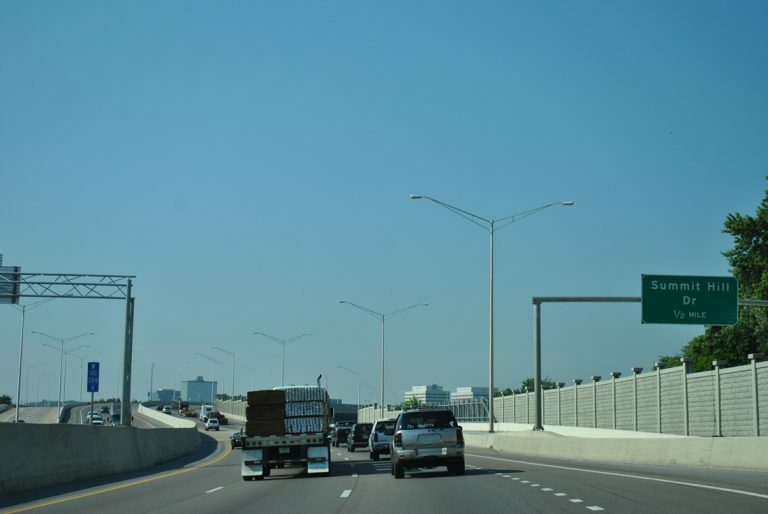 The $12 million project began in 2001.1 Even with these additional lanes, other sections of Interstate 40 are planned for improvements as the area continues to gain population. Started in May 2013, the Fortify I-40/440 Rebuild Project reconstructs Interstate 40 between U.S. 1 near Cary and Interstate 440 and its curve northward to the Knightdale Bypass (I-495 & U.S. 64-264). Phase I through summer 2015, expanded the easternmost three miles of the project area, covering I-440 from Exit 301 of I-40 to I-495 (Exit 14). Underway between late 2014 and late 2016, Phase II focuses on Interstate 40 between Exits 293 and 301 on the south side of Raleigh. A proposal for I-40 emerged from the threat of Hurricane Isabel, a 2003 storm that packed 160 mph winds at one point. North Carolina officials debated a plan to switch Interstate 40 into a one-way facility in the case of a major hurricane threat (category 3 on the Saffer Simpson Scale with winds of 111 mph or greater). Under the plan, 90 miles of Interstate 40 between Wilmington and Interstate 95 are switched to contraflow, with all lanes made north-bound or west-bound during the evacuation phase of a hurricane threat. The configuration will end several hours before the arrival of Gale Force or higher winds from the threatening storm. To mitigate the effects of potential situations where emergency and other vehicles needing to travel east toward the coast during evacuation situations, a maximum 12 hour window will be implemented for the contraflow of Interstate 40. At the end of this time frame, traffic patterns will return to normal before wind speeds become a threat.5 Similar configurations on the Interstate system exist along Interstate 26 in South Carolina, Interstate 59 in Louisiana and Mississippi, and Interstate 65 in Alabama. Contaflow originated after Hurricane Floyd made landfall at Wilmington, North Carolina in 1999.5 That particular storm packed 140 mph winds before weakening at the Carolina coast line to 105 mph winds. The lingering storm produced substantial flooding throughout eastern North Carolina. As for Hurricane Isabel, the storm system made landfall at Drum Inlet in North Carolina packing 105 mph winds on September 18, 2003. The storm was blamed for 29 deaths and $1 billion in damages, including substantial damage to NC 12, the coastal route along the Outer Banks. Although California 58 between Bakersfield and Barstow has been submitted for inclusion in the Interstate Highway System, it is not currently part of California’s Interstate System. With the ongoing improvement of California 58 between California 99 and Interstate 15 to Interstate standards, an extension of Interstate 40 over the California 58 freeway makes more sense. However, there is no official plan to extend Interstate 40 west at this time. Meanwhile, in Wilmington, North Carolina, Interstate 40 was proposed to be extended southeast beyond its current terminus at U.S. 117. The extension would extend to Martin Luther King, Jr. Parkway by running the new highway largely between Kerr Avenue and Wilmington International Airport (ILM). From the airport, the extended Interstate 40 would then follow Martin Luther King, Jr. Parkway west into downtown, ending at the Isabel Holmes Bridge somewhat near where North Carolina 133 and U.S. 421 intersect. This project was introduced in December 2004, and was later discussed by local planning and business groups.11 Nothing has transpired from these developments since however. As of May 6, 2008, I-40 overlaps with Interstate 69 north from I-240 to Downtown Memphis, Tennessee and the interchange with SR 300. Within Texas, Interstate 40 was an original Interstate Highway, and it was approved by the Texas State Highway Commission in 1962 with 182 miles.13 The Texas portion of IH 40 was completed prior to the completion of the companion section in New Mexico in the mid-1970s (from Tucumcari to Glenrio). Bypasses around Vega and Shamrock were added in the 1970s and early 1980s. The IH 40 bypass of McLean, Texas, was constructed between March 1982 and Summer 1984. There are a few at-grade intersections west of Vega on Interstate 40 for ranch access; technically, this feature does not meet Interstate standards. 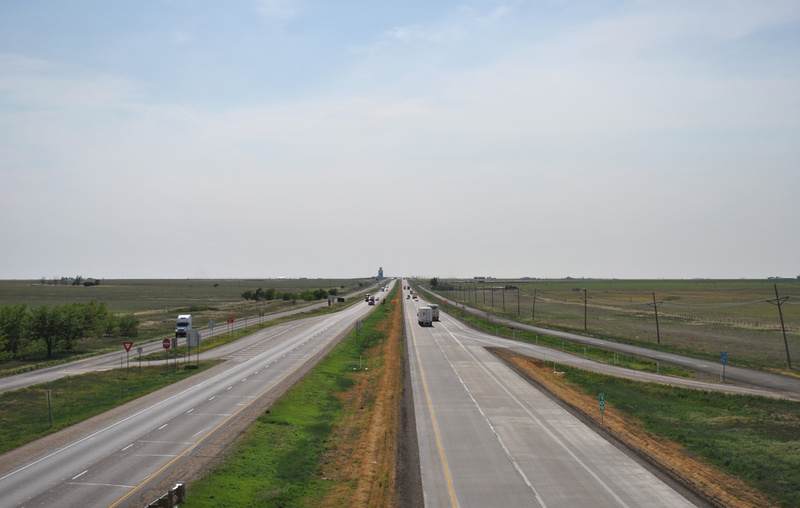 Interstate 40 traverses the open plains of Carson County, Texas in this scene looking west from FM 294 at Exit 109. Photo taken May 5, 2012. 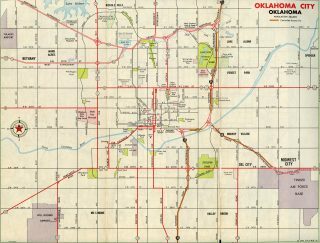 To the east, the first section of Interstate 40 to open to traffic was a five-mile stretch east of Canute to Oklahoma 44 (Exit 53); it opened in April 1959. 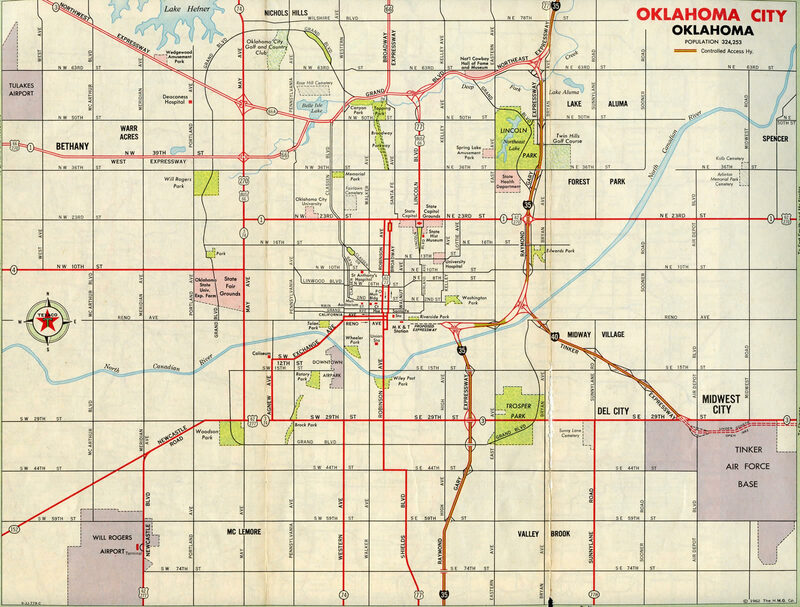 Interstate 40 in Oklahoma was declared complete with the completion of the 17-mile bypass of Erick in June 1975.14 Old U.S. 66, which had carried traffic through Erick, was recommissioned as Business Loop I-40. One of the most controversial sections of Interstate 40 to be constructed was the alignment through Memphis, Tennessee. Known today as Sam Cooper Boulevard, this freeway was built for about two-thirds of its intended distance. Sam Cooper Boulevard reaches its western terminus at East Parkway North, without entering Overton Park. Local opposition and resistance to the freeway’s passage through the sensitive area resulted in Interstate 40 being rerouted onto the northern half of the Memphis beltway. Plans for this route in 1956 called for Interstate 40 to bisect the city of Memphis, offering freeway access from the east. The exact route of the corridor, which included the freeway and expressway sections of Sam Cooper Boulevard as well as the unbuilt section through Overton Park, was adopted in 1966. 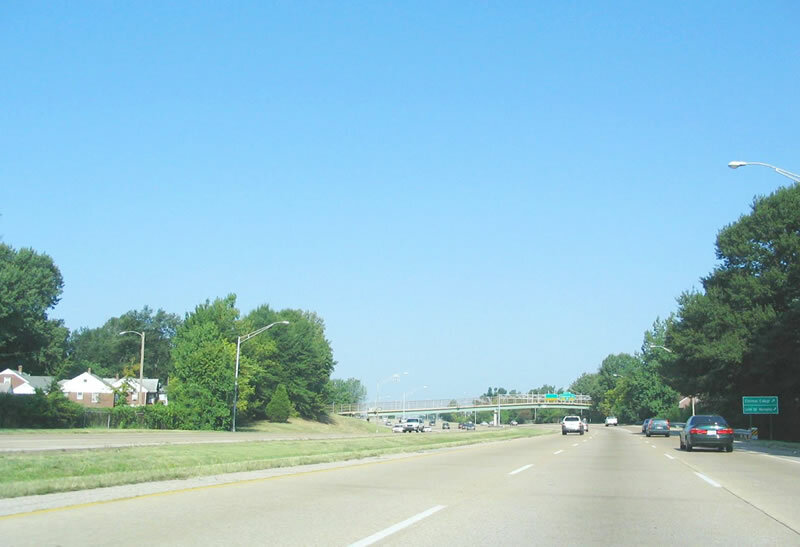 After the Tennessee Department of Transportation acquired the necessary rights-of-way from the city of Memphis, the design and construction of Interstate 40 was thought to be approved in November 1969. Construction ensued, including the much less controversial approach road from the west. As a result of this, the unbuilt section of Interstate 40 as well as the approach road (which was already under construction) were removed from the Interstate Highway System. The section of freeway orphaned west of Interstate 240 became an unnumbered highway (Sam Cooper Boulevard) with some sections built to freeway standards and others built to boulevard standards. The following suite of photos provides some views along Sam Cooper Boulevard. The first several miles of Sam Cooper Boulevard are built to freeway standards. Pull through signs continued to reference Little Rock for the continuation of I-40 after the route was relocated onto the Memphis beltway. 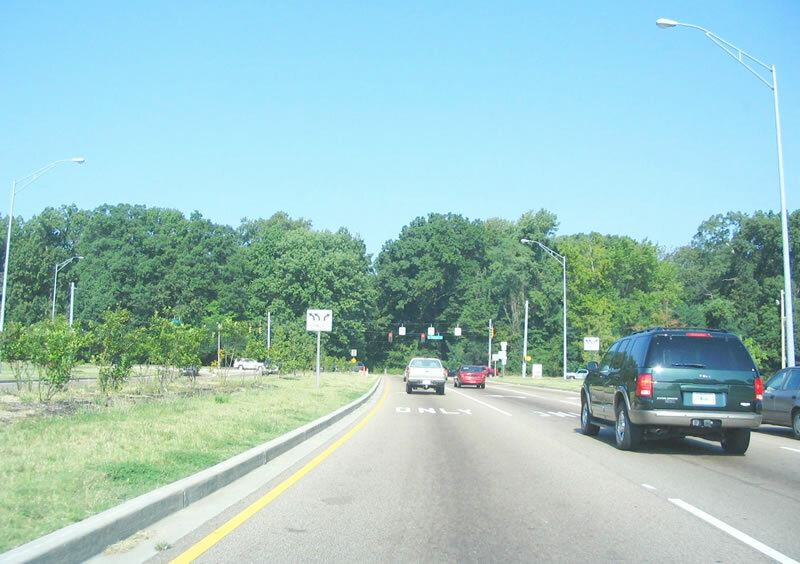 Heading west to U.S. 64-70-79 and SR 57-277 (East Parkway North at Overton Park, the freeway transitions to an-grade boulevard with signalized intersections. 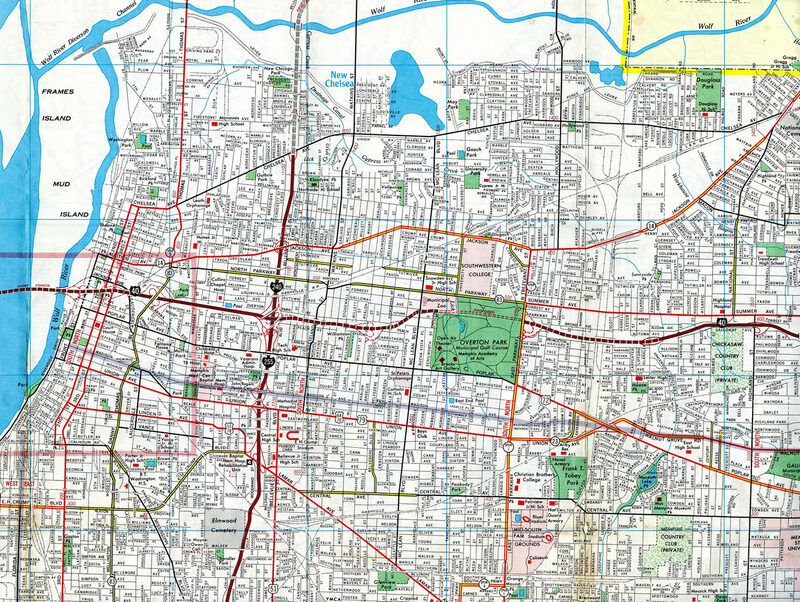 1972 Gousha map of Memphis, showing the original planned route of Interstate 40 through Midtown and Overton Park in Memphis. The cancellation of I-40 through Midtown Memphis resulted in the relocation of the mainline to run along side Interstate 240 to the north. The two routes were cosigned until 1982, when I-240 was dropped from the overlap. Subsequent work between June 2003 and December 2006 reconfigured the junction between I-40/240 at Midtown to remove unused ramps and redesign the exchange into a high-speed directional T interchange. The east end of Interstate 40 was previously located in Raleigh, North Carolina, where the Wade Avenue freeway ties into the Raleigh Beltline (I-440 & U.S. 1). Photo taken by Jeff Morrison (08/08/05). Interstate 40 in Winston-Salem was relocated onto a new alignment as a result of approval from the AASHTO Special Committee on Route Numbering on October 2, 1992. The old alignment was recommissioned as Business Loop I-40. An original Interstate highway, Interstate 40 was initially slated to end at its junction with Interstate 85 in Greensboro until 1968, when its route was extended eastward to Interstate 95. There was some difficulty in determining which route Interstate 40 would ultimately take. At first, the state petitioned for the Interstate 40 freeway to follow U.S. 70 from Raleigh-Durham east to Morehead City in 1962. 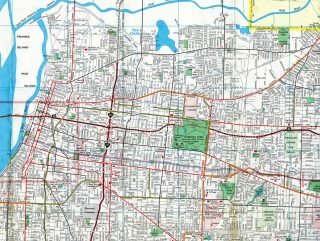 Although that plan was rejected, U.S. 70 has gradually been upgraded to freeway and expressway standards from 2000 onward. Meanwhile, the 1968 extension of Interstate 40 allowed the freeway to reach one of North Carolina’s principal ports and largest coastal cities at Wilmington and provide additional coverage for hurricane evacuation.9 It took two decades for the route to be completed and opened to traffic; it opened on June 29, 1990, which marked the completion of the entire transcontinental route. AASHTO approved the designation of the section of Interstate 40 between Raleigh and Wallace (about 30 miles north of Wilmington) after the road was completed, on December 7, 1990. The last shield assembly for Interstate 40 eastbound. The freeway advances south from I-140 along side an industrial park. Photo taken 12/31/17. Parallel U.S. 117 and North Carolina 132 (College Road) converge with Interstate 40 at the final eastbound interchange (Exit 420) in two miles. Photo taken 12/31/17. Interstate 40 shifts westward by Olsen Park along an S-curve leading into the parclo interchange with U.S. 117 & N.C. 132 (College Road) north at Gordon Road. Photo taken 12/31/17. Exit 420 loops away from I-40 east to U.S. 117 & N.C. 132 north to Castle Hayne. The mainline freeway transitions directly onto southbound U.S. 117 and N.C. 132 ahead. Photo taken 12/31/17. Traffic from U.S. 117 & N.C. 132 forms a third southbound lane as I-40 crosses Smith Creek. College Road extends south from the freeway end as a six-lane arterial into Wilmington. Photo taken 12/31/17. U.S. 117 & N.C. 132 overlap 5.5 miles north through Wilmington along College Road. Passing through the Kings Grant community, the arterial approaches the westbound beginning of Interstate 40 and Exit 420A with Gordon Road. Photo taken 12/31/17. Back to back ramps depart from Interstate 40 west just beyond Smith Creek. 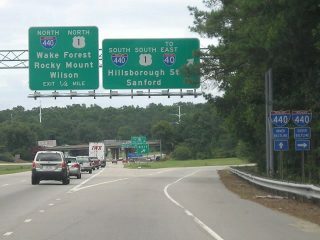 Exit 420A links the nascant freeway with Gordon Road to the east side of Wilmington International Airport (ILM). U.S. 117 & N.C. 132 resume along College Road north via Exit 420B. Photo taken 12/31/17. Begin Interstate 40 shield assembly posted ahead of the lane drop for U.S. 117 & N.C. 132 (Exit 420B). The freeway travels along a mostly rural route north 111 miles to Future I-42 west of Clayton and to the south of the Raleigh metropolitan area. Photo taken 12/31/17. U.S. 117 branches west and parallels Interstate 40 along side N.C. 132 to Castle Hayne. A previous overhead assembly here referenced Benson, where I-40 meets I-95, in place of Raleigh and Jacksonville for I-140 east to U.S. 17 north. Photo taken 12/31/17. Complimenting the mileage sign at the eastbound beginning of Interstate 40 in Barstow, this assembly stood along westbound just ahead of the Murraysville Road overpass outside Wilmington. The 2,554 mile distance sign was eventually removed and never replaced. Photo taken 06/24/10. The first westbound shield follows the Murraysville Road overpass. Drivers along I-40 will reach I-140 in two miles, Benson in 94 miles and Raleigh in 123 miles. Photo taken 12/31/17. Interstate 40 runs along side a Union Pacific Railroad line and the dry bed of the Mojave River to Exit 1 with Main Street (Historic U.S. 66). Main Street is Business Loop I-15 leading northwest to I-15 and the Barstow business district. Photo taken 07/12/15. A small guide sign is the first indication to westbound travelers along Interstate 40 of the pending merge with Interstate 15 south. Photo taken 07/12/15. The parclo interchange (Exit 1) with East Main Street lies just west of Dean Wash along I-40. A Breezewood style connection links Interstate 40 west with I-15 north via a half mile of Main Street. Photo taken 07/12/15. Traffic partitions for Main Street to Interstate 15 north to Las Vegas and the final 1.3 miles of I-40 west to I-15 south to San Bernandino and San Diego. Photo taken 07/12/15. Exit 1 leaves I-40 west for Historic U.S. 66 / Main Street northwest to I-15 and central Barstow and south to Montara Road. Photo taken 07/12/15. The last reassurance marker for Interstate 40 precedes Blair Ditch and the wye interchange with I-15 south. Photo taken 07/12/15. The merge with Interstate 15 south was expanded by 2000. The ensuing exit departs in 0.75 miles for California 274 (Barstow Road). Photo taken 07/22/14. Interstate 15 north, 0.75 miles ahead of the split with Interstate 40 east at Exit 183 to SR 247 (Barstow Road). Photo taken 03/29/15. A lane drop occurs along I-15 northbound at the wye interchange (Exit 184A) with Interstate 40 east a half mile beyond the Barstow Road overpass. Photo taken 03/29/15. Interstate 40 travels 141 miles east from Barstow across of series of arid mountain ranges and desert valleys to U.S. 95 at Needles. Photo taken 03/29/15. Northbound Interstate 15 reaches Interstate 40 in Barstow. Greenout overlays conceal original shields for both U.S. 66 and U.S. 91 shields. Photo taken 03/29/15. Interstate 40 button copy sign formerly posted just ahead of the eastbound beginning from I-15 north. Photo taken by Jeff Royston (01/99). Crossing the dry Mojave River, Interstate 15 south progresses one mile to Main Street (Exit 184) in Barstow. There is no direct ramp from I-15 south to Interstate 40 east. Instead motorists are directed onto a half mile of Main Street east to make the connection. Photo taken 08/14/16. Main Street doubles as both Business Loop I-15 and Historic U.S. 66 east to I-40 by Barstow Mall and west through the Barstow business district. Photo taken 03/31/15. Vintage button copy signs on the Riverside Drive overpass mark the parclo interchange (Exit 184) with Business Loop I-15, County Road 66 and Main Street. I-15 continues five miles west to SR 58 toward the San Joaquin Valley and south 71 miles to San Bernandino. Photo taken 08/14/16. Replaced button copy sign posted one mile ahead of Main Street east to I-40 on Interstate 15 south at the Soapmine Road underpass. Photo taken by Brian Dowd (05/19/03). A second button copy sign preceded Main Street along I-15 south at the Mojave River. Photo taken by Brian Dowd (05/19/03). Leading away from I-15, motorists on Interstate 40 pass a mileage sign referencing the full length of the freeway east to Wilmington, North Carolina. I-40 is the third longest Interstate highway in the country, after I-90 and I-80. The freeway crosses eight states, with over 400 miles across both Tennessee and North Carolina. Photo taken 06/27/09. “I-40 east lane opens.” News and Observer (Raleigh, NC), September 2, 2003. “Hall of Fame Drive/Interstate 40 Project,” Tennessee Department of Transportation, web site, accessed August 2003. “I-40 Crosstown History.” Oklahoma DOT. “ODOT, partners celebrate approval of Crosstown project.” Oklahoma DOT. May 13, 2002. “Officials review I-40 reversal plan.” News and Observer (Raleigh, NC), September 15, 2003. “I-40 in El Reno gets face lift.” Oklahoma DOT Public Affairs Media Advisory, August 13, 2002. “I-40 victims’ memorial to be dedicated.” Oklahoma DOT Public Affairs Media Advisory, May 22, 2003. “I-40 Bridge Opened to Traffic 7-29.” http://www.okladot.state.ok.us/public-info/i40-bridge.htm Oklahoma DOT Public Information. Lansford, John; “Wilmington Proposes Extending I-40,” post to Misc.Transport.Road newsgroup; 12/26/04; based on article appearing in the Wilmington Star-News. Celebrate the Interstate: America’s Interstate Highway System Turns 50!. http://www.okladot.state.ok.us/okinterstate50/ Oklahoma Department of Transportation. Skiles, Kent; Personal Email “AARoads feedback: I-40 In Little Rock,” 12/09/06.